Backstories and Magical Secrets of Walt Disney World by Christopher E. Smith is Volume 1 and focuses on three lands of the Magic Kingdom. 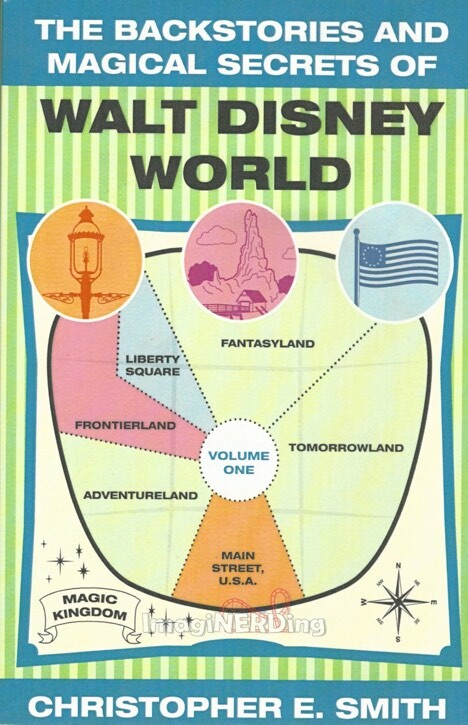 Yes, this is a 250 page book that only covers three lands of one theme park at Walt Disney World. Hopefully, Chris will be able to continue this series. So, Chris takes us on a journey through the backstories, histories (real and imagined) and secrets of Main Street, USA, Frontierland and Liberty Square. These are good subjects since they flow so well into each other, physically and literally. All three lands have a basis in Amercian history, as well. The book starts on Main Street and Chris discusses all of the little details and stories. And Main Street has a lot of them. He even covers every single window tribute and the stories behind the shops. Chris follows the same path for each land, including offering the scripts for the attractions and the details in the queues. He shares the little tributes from boxes and displays while describing their importance. In a few instances, Chris dedicates an entire chapter to just one attraction or shop/restaurant. The Haunted Mansion, Ye Olde Christmas Shoppe, Big Thunder Mountain Railroad, Splash Mountain and a few others offer more detail, partially because of the scope of the secrets and details. What’s important about this book (and hopefully the series) is that Chris has documented all of the secrets and backstories in a book. He’s compiled official stories, unofficial stories, rumors, myths, legends and fan stories. He also takes the time to explain each one and the merits of them. In some cases, he might dismiss them or show how it’s a fan-based rumor and not grounded in reality. But he has done an exceptional job of getting everything in one place. My only issue with the book (and this has happened with other Theme Park Press (TPP) books) is the utter lack of notes, be they end note, foot note or chapter note. There is no way to trace Chris’s research, so future historians and fans won’t be able to follow-up. This is a really big issue. Granted, I know that TPP wants to appeal to the lowest common reader and most people just want to read about Disney as opposed to thinking critically. I do wish that Chris had included where he ran across some of the facts and stories because there were quite a few stories that I’d not read before. Walt Disney World fans, especially those enamored with the history and backstories and going to love this book (and the series). I’m glad that Chris took the time to write the book and offer thoughtful rationale on the subjects, especially since many of the facts about Disney can be urban legends. Are you going to pick up a copy of The Backstories and Magical Secrets of Walt Disney World? Find out how you can be an ImagiNERD, here!